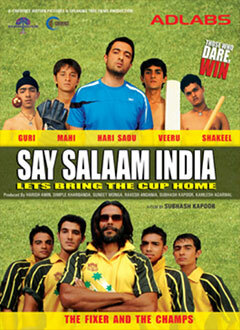 Salaam India is the story of cricket …it’s a story that revolves around a group of 4 boys and their passion for the game. The boys come from humble backgrounds and limited resources but what they have is a zeal for the game of cricket and undeniable natural talent. They study in the local corporation school where the most important sport on agenda is wrestling…. Taught by Wrestling Guru Surinder Huda- a man driven by hatred for cricket because in his eyes it is cricket that is responsible for destroying traditional sports like Kushti, Kabbadi, Hockey etc. The story begins with establishing the 4 boys Viru, Mahi, Shakeel and Guri and their milieu, and how they fight their circumstances and lack of resources to pursue their fervor for the game. From here the story moves on to an elite school “Royal Heritage” in the state capital. It is here that we meet the protagonist of the film, Hari Sadu, a Cricket Fanatic who believes that gully cricket is to be played with a similar commitment as any other level of cricket even if it’s the World Cup…. A man who believes that cricket should be played for the love of it and nothing else, and man for whom playing good cricket is more important than just winning matches. His new job is to coach the Royal Heritage team to win their sixth state championship, but he faces a stiff opposition to his coaching methods by the headstrong, arrogant members of the school team…. Who are more impressed with Sachin’s Ferrari than his batting skills and hard work behind it. The boys are talented but don’t have the passion and the discipline to match Hari’s ideas and conviction. This results in a lot of situations, which add to the already simmering tension…. Leading to a final showdown where Hari Sadu is wrongly accused and is thrown out by the board of members. He’s replaced by Harry Oberoi, who is more of a suave fixer from the cricket world than a coach, but suits the image and profile of the school. What will Hari do? Will he fight back with a team that he will create? Will the underdogs battle it out with the more privileged ones? Will Hari be able to bring home the cup? Sanjay Suri, a dependable actor, is in top form yet again. It’s sad that film-makers haven’t woken up to this talent yet. In his upcoming career so far, there has rarely been a performance [one can’t think of any though!] where Sanjay Suri hasn’t been his natural best. JHANKAAR BEATS, PINJAR, MY BROTHER NIKHIL, BAS EK PAL – the hallmark of Sanjay has been his delightful screen presence. The same holds good in SAY SALAAM INDIA too where he shows once again that he is capable of delivering goods every time. He is one actor who is highly under rated and deserves to be recognized by the big daddies of Bollywood! Sanjay Suri shows his caliber once again and he shows what it takes to keep on ticking in a system that is so adept to serve stars. Sanjay gives a performance that is so subtle yet shining. He has all the capabilities to carry some intricate roles of the cinema, and if filmmakers are not using him, then it is the loss of cinema and not his. Here he will find a very dedicated coach in Sanjay Suri, who has carved in an excellent performance, taking one back to the time of MY BROTHER NIKHIL.